Cleaning & Checkups - Dentallive Clinic LTD. Dental plaque is the primary cause of gum disease eventually leading to tooth loss and decay. WHAT TO EXPECT DURING A PROFESSIONAL TEETH CLEANING? Do your gums bleed when you brush or floss? Do you have sensitivity or pain when you eat certain foods? Yellowing of your teeth? Cleanings and checkups will allow the team at Dentallive Clinic to diagnose your periodontal issues and get you back to health. Daily brushing and flossing will keep dental calculus to a minimum, but a professional cleaning will remove calculus in places your toothbrush and floss have missed. Your visit to our office is an important part of your program to prevent gum disease. Keep your teeth for your lifetime. Be able to enjoy foods and drinks again. Periodontal disease and decay are both caused by bacterial plaque. Plaque is a colorless film, which sticks to your teeth at the gum line. Plaque constantly forms on your teeth. By thorough daily brushing and flossing you can remove these germs and help prevent periodontal disease. This plaque overtime builds and requires one of our 5 hygienist to remove stubborn calculus. WHAT IS INVOLVED IN A CHECKUP? Some people have a strange attitude towards checkups. They think that if the dentist doesn't find something wrong, they've wasted their time. 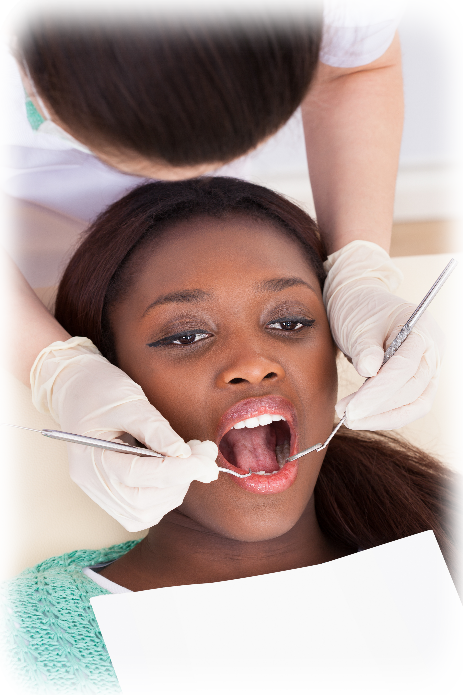 A series of successful checkups can discourage people from ever seeing their dentist again. The idea that you should only see your dentist when something is wrong with your teeth may end up costing you a lot of money, time and comfort. Your dentist can detect and treat most dental problems before you're even aware of them. Checkups are not isolated events. They're a series of regular assessments of the condition of your mouth, part of a long-term strategy for keeping healthy. A successful checkup shows you that your home care is working, and that it's not a waste of time. Also, regular professional cleaning will make an enormous difference to the condition of your mouth. Review of dental records, medical history and past X-rays. Your dentist keeps detailed records of your dental health. If you move to a new community or change your dentist for another reason, make sure a copy of your records is transferred to your new dentist without delay. Your request for this must be in writing. Your dentist may charge a reasonable fee for copying your records and x-rays. Overall examination. Dentists don't just check your teeth; they also check your gums, tongue, cheeks and palate to assess your overall health. X-rays if necessary. X-rays help the dentist check areas of teeth and tissue otherwise not visible. They show cavities instantly; they show the location and condition of your present fillings, and even the condition of the root and tissue surrounding the tooth. Done properly, dental X-rays are completely safe. Even so, it's good practice to avoid any unnecessary exposure. You should tell your dentist if you are pregnant, or if you have recently had a lot of medical X-rays. This is a must for preventing gum disease, the number one cause of tooth loss in adults. It also makes your teeth and gums look great. Fluoride treatment. Regular fluoride treatments are a useful supplement to the fluoride many of us already get in our drinking water and most dental hygiene products. These treatments help prevent tooth decay; recent studies also suggest that fluoride may slow down plaque formation as well. Counseling. After an examination, your dentist assesses your home care practices, and may give you advice or information about areas that could be improved. Only you and your dentist can determine the answer to that question.